Lindblom at age 20 was one of the top 3 forwards in the SHL, a men's league which is third best in the world after the NHL and KHL. He's just a tad bit off with his timing, but all advanced stats point to how well he plays the game, he forechecks, goes to the net and is defensively responsible. The SHL is not a physical league. A good portion of Lindblom's goals were scored in front of the net by overpowering a defenseman or redirecting a shot with no one clearing him out. He simply won't get nearly as many of those scoring opportunities in the NHL. I'm not saying he won't be good, but I am not sure those stats you are referring to will translate to the NHL. Frost is nothing like TK, Frost has great speed but he's not an explosive skater like TK, he's extremely smart (Hextall raves about his hockey IQ), has improved his shot, first rate playmaker. He's coming off a post-draft season where he was one of the top 2-3 players in junior hockey, 112 points in 67 games after a slow start wiith a ridiculous +70. Frost is a much better passer and will have a different role than TK. From watching him I could see how you may not think he's an explosive skater, but the NHL combine results would refute that. Just a comment on Morgan Frost, who I think will eventually become an excellent second line center for the Flyers, right now he's 6',172#. Some people are expecting him to make the club next season and that is looking for too much. He has skills but needs to get his body up to the level where he can handle NHL play. TK is 5'10" and 174. Frost is 5'11" and 172. I get the gripe that he's not that big, but I have always been of the opinion that smart or fast players can play around physical situations. I still think he makes the team next season. Especially if a forward or two gets moved. Not sure when he would move into a 2nd line center role without some major line reconfiguration. I'd like to see Couturier be a top-2 center for a while and I assume Patrick will be the other one. He definitely has the vision to be a 2nd line center.... it's just a numbers thing. It will be interesting to see how it shakes out. TK was 5'10 170 at the Combine at 18, now he's more like 184 lbs (Flyer TC roster). Frost was 5'11 172 at the Combine, might be up to 175-180, but he's got a slighter frame than TK. Frost needs to add a little size, but Giroux was the same size as a 21 year old rookie, for Frost, survival will rely on the instinct to avoid big hits. That was my point. TK and Frost were relatively the same size when they were drafted. I don't see size being an issue with Frost making the team next year. Kind of hard to get a grip on where the Flyers are going. A Youth movement is really the only way to go, but that puts them 3 -4 years away from being a cup contender if the young talent pans out. I don't think there is any other way to get there with the group of veterans they have now. Next year is basically a season where you have to bring in the youngsters and let then go through their bumps. It is a waiting game until Carter Hart comes up, which could be late next year, or for sure 2019-2020. I'm all for another wave of rookies next year. Frost, Rubtsov, Myers and Morin should all make the team and Sandheim and Lindblom should become full tme players. Frost will likely have to come off the center position and play wing. Filppula is gone, so are Manning and Read. MacDonald's contract is an albatross, they need send him down to the AHL again where he won't count against the cap. Maybe someone will claim him, but I doubt it. Neuvirth and Elliot are under contract next year. No sense going after a goalie with Hart coming soon. If you go next year with a roster of Giroux, Voracek, Couturier, Simmonds, Patrick, Konecny, Lindblom, Frost, Rubtsov, Weal, Raffl, Lehtera as your forwards and Provorov, Gostisbehere, Sanheim, Hagg, Myers, Morin with Gudas as your 7th D, then the Flyers would be around 19 Mil under the salary cap. I don't think they should go out and sign a big number free agent, the class is not that great this offseason. They will likely have 2 first round picks (theirs and the Blues), but they lost a 3rd round pick for the Mrazek trade. They don't have anymore buyout/dead money on the books. If they could trade for stud blue liner, that would be the most effective use of the cap space. Hextall sees eye to eye with Hakstol, both believe in being conservative with player development. NAK and Morin will be up this year. Myers is a question mark, because he missed half a season last year in juniors and around 20 games this year, a long playoff series where he plays well will increase his chances, but he's more likely a mid-season callup. Vorobyev is in a similar position, he didn't play a lot in the KHL, so this is his first full season. Knight, MV and Bardreau will get a shot at winning bottom of the roster jobs. Frost is NHL ready, but is he physically ready? That will determine if he makes the team or returns to junior. Hart, Rubtsov, Laberge, Bunnaman, Twarynski will spend the year in LHV. Allison and Laczynski have yet to sign, if so, they go to the AHL. Hogberg, Bernhardt, Kase, Lycksell and Sandstrom will spend another year in the SHL. Ustimenko hopefully will get promoted to the KHL. It's gong to be a steady flow from now on, with players backed up in Allentown, fighting to make the roster each September. But Ron is not going to rush anyone he doesn't think is ready to start in the NHL. I (personally) was never, ever, interested in firing Brown. It was clear he was a good coach for the team's goals during the process. This is really the first year we can evaluate his skill in trying to win games regardless of the development of his talent, and the results seem good. He could be great. Hak, on the other hand, seems to be bad at developing talent AND average-at-best at trying to win. As I've written before, it's pretty clear he's not a great coach, and the flyers need to be looking for "great." You can't develop talent if you're afraid to play the young guys. Yeah Hakstol is just kind of puzzling to me. They're developing him as well as the players, but on what timetable? He will either have to last as long as Brown or he'll probably give way to another coach next year (if not right now). I don't see much point in replacing him with a more experienced retread type NHL coach though. An assistant or junior or AHL guy maybe. I don't think he did that bad a job during the season either. He's got a bit too learn in the playoffs and only one way to do that. Some of the player decisions were baffling, yeah, but presumably the GM didn't feel that differently. If the youth movement is 3-4 years away and the team won't add any top-6 forwards or top-4 defensemen, then I think Giroux and Voracek should be dealt for any reasonable offer. I think Simmonds gets dealt either way. I think MacDonald's contract was an albatross, but he's been decent the last two years and he may be able to be dealt with two years left on his contract. Long piece but here's O'Connor's ultimate take. I think it's either his way or what you say, time to move on. Charlie O'Connor evaluates a truly bizarre Flyers season in a number of key areas and looks ahead for what the offseason and future may hold for the organization. From where I sit, it's time for Hextall to push some of his chips into the middle of the table. The Flyers need to find out if Hakstol can successfully coach a team with contender upside, and if the Giroux/Voracek core is good enough to be the backbone of a Cup-caliber roster. Huge seasons aside, they're not getting any younger. If the goal is to try and win a championship with them playing key roles, the time is now to give them some real help. This is the most exciting offseason of Hextall's tenure as Philadelphia GM, because the time finally appears right for some intelligent aggressiveness in terms of asset management and player acquisition. If veterans are so important to the development of young talent, the kids can't keep playing with underwhelming ones; they need older teammates who can help them to elevate their games, not drag them down. And the high-end veterans need more support as well, while they still remain high-end veterans. 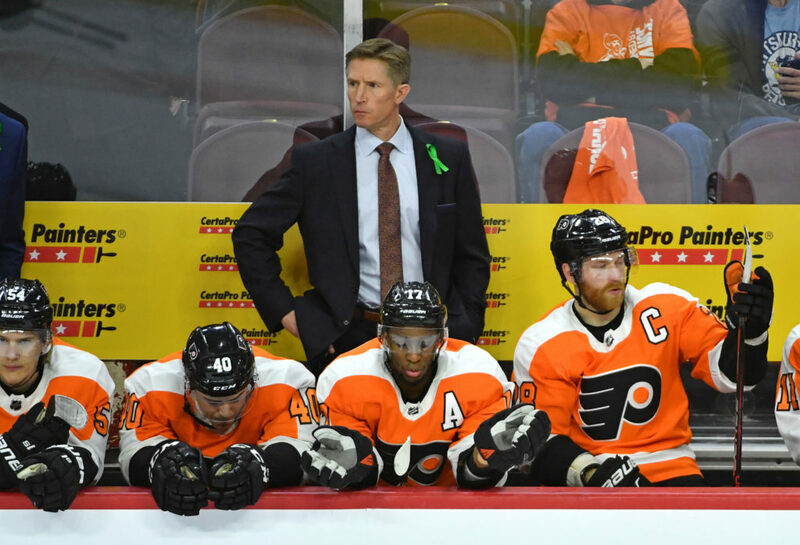 Finally, the Flyers need to fairly evaluate Dave Hakstol the coach by giving him a club capable of contending and determining if he can meet the high expectations that come with such a squad. For fans, the roster excuse is getting old, for all involved.. When you have two elite, young talents in Embiid and Simmons, a lot of coaches are going to look good in "developing" them. Surround them with an elite 3D guy (RoCo) and a bunch of others who make 38% of their 3 pointers and is it really Brett Brown who is behind the good season? What about Okafor and Noel? He didn't do much to develop them. Plus, you are comparing the 1st year where you are evaluating Brett Brown (why? because the young, top picks are finally getting minutes?) and seem to be evaluating Hakstol during a rebuilding process. Do you not think that players like TK, Provorov, and Ghost have developed under Hakstol? Couturier, Giroux, and Voracek just had a career years. Other top prospects are either too young to evaluate or not up with the team yet. And I am not advocating for Hakstol. I just think waiting to evaluate Brown until all the prospects arrive and not doing the same with Hakstol seems odd. Brown developed Covington and TJ. He had Noel playing well, but his contract situation and the presence of the #3 pick (Okafor) really made that difficult. I do blame Brown to sone extent for the Noel/Okafor debacle, but BC has to take some of the blame there, too. Brown also developed a few d-league players like Sampson and Frazier who are no longer with the team. He never seemed afraid to play guys like Hakstol is. I'll respond further later--busy now. I guess you could make the point that Brayden was traded and had a career year elsewhere, but he was never paired with natural goal scorers in Philly (except on the power-play). I still like that trade, even though it has currently worked out better for the Blues. For Hakstol, let's look at the last game v. Pitt where Gudas essentially gave away 2 goals ...my contention is that if Hak had just stuck with the young defensemen from the start of the year, lived with their mistakes, and coached them up maybe there would have been a young guy in there instead of Gudas who wouldn't have made those mistakes, and we'd still be playing. I'd rather go with a young unknown than a known mediocrity. I think Hak (and the organization) don't share that belief, and I think they are demonstrably wrong in that idea. But Provorov also gave away a goal in the last game. I will not argue about Gudas as I am not sure why he's been on the team for the last few years. Who else is even a viable NHLer? Myers or Morin? I don't think Morin was available and Myers simply doesn't have a lot of games at advanced levels. I understand the argument, but if you look back at articles from the start of the year lots of writers were arguing that Myers should have been retained despite his inexperience. I think the organization needs to go more all-in with high-variance young players. Let's say player "quality" can be graded on a 1-10 scale (10 being highest). When they have a young guy who they think could be somewhere between a 3 and a 7, and a vet they know is a 4, they are so afraid of the "3" performance they hold the young player in the AHL and settle for the veteran "4". I'd take the risk and trust my player development, hoping to get the "7". Do we really know how much Hakstol has control over the roster. I suspect Hextall has final say on when a young player is brought up. I'm not sold on Hakstol yet either, but I don't see the need to fire him now. I give him at least next year, and next year to me, is really not about winning, but about how the young players develop.